So I’m pretty much jumping on the ‘checked shirts for autumn’ bandwagon here, but I really like how they look layered over the top of a white vest and worn with a nice pair of fitted jeans. I’m not a huge fan of the tartan trend, so I don’t feel it would get much wear outside of autumn/winter, so I thought this one from Peacocks was a nice option at a reasonable price. I have a few pairs of ankle boots already but I’ve been on the lookout for the perfect pair to wear on dressier occasions. This gorgeous pair from Faith look like they could be just what I’m after. They are pretty pricey though so I’m hoping I may be able to pick up a similar pair for a lower price seeing as I’d only wear them occasionally. Isn’t this just the cutest little tan bag? It really reminds me of the Rebecca Minkoff Mini Mac, but obviously for a much lower price tag! Sadly the Rebecca Minkoff ones are not in my budget at the moment so when I saw this one from H&M, I thought it would be the perfect alternative. And cognac is the colour for autumn accessories. Now this item would be quite a splurge as it’s pretty expensive for a jumper, but I was instantly drawn to it when I was browsing. The cobalt blue colour, the chevron detailing in the knit… I would definitely be wearing this as often as I could get away with! Another accessory here, and the cheapest item on my list. For less than £2, you can get this scarf to add a little flash of autumn colour into your wardrobe. I love berry colours paired with black; I would pop this on with an all black outfit. Finally, a cute little tan skirt that can be paired with thick tights for those of us that don’t always want to wear jeans or trousers. This skirt really ticks all the boxes for me; the suede fabric, the shape and the cute little pockets. I’d wear it with my black turtleneck top to keep nice and toasty. 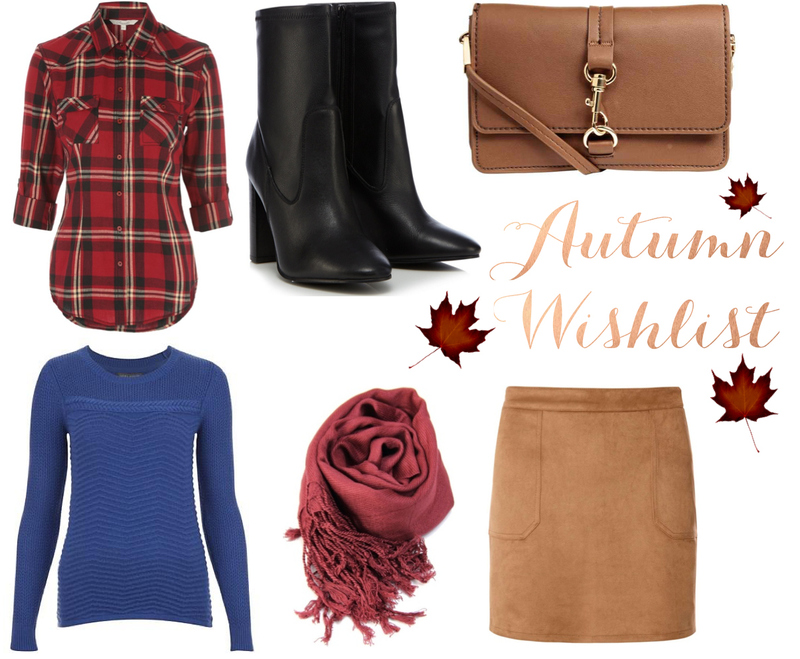 Are you planning on making any new additions to your wardrobe this autumn? * All links and prices correct at time of writing.